How to Install UNetbootin on Linux & Ways to Burn ISO to USB Drive? UNetbootin allows you to create bootable Live USB drives for Ubuntu, Linux Mint, and other Linux distributions also Windows ISO without burning into a CD/DVD. UNetbootin is a simple program which can run on Windows, Linux, and Mac OS X to burn any ISO file directly into USB flash drive. 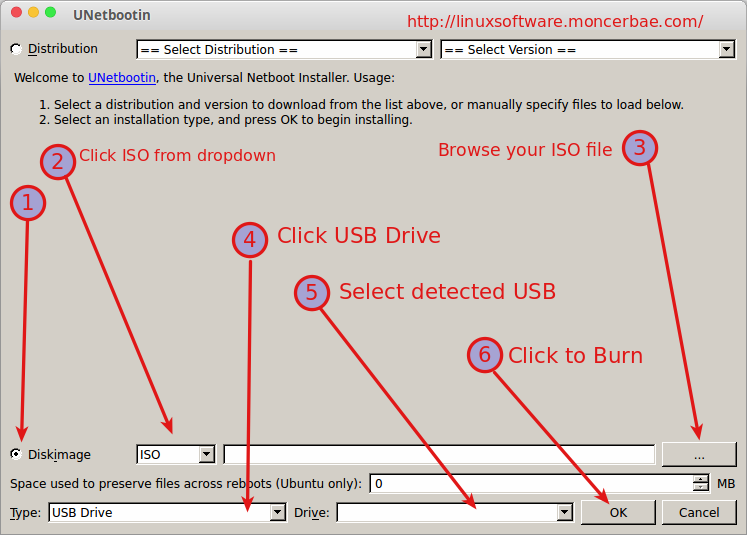 UNetbootin can create a bootable Live USB drive/ It loads distributions either by downloading a ISO (CD image) files for you, or by using an ISO file you've already downloaded. Wait until installation completed! Now you can open UNetbootin after install by clicking Start Menu >> Administration >> UNetbootin. You will be prompted for password. To begin burning process, click OK button. This will take some time to complete, depend on your computer speed. How to Install K3B Burner The Nero Alternative for Linux. This guide will install how to install K3B CD/DVD burner program in Linux easily with short review about the Linux program. What is K3B Burner ? K3B is stand for (KDE Burn Baby Burn) is a Linux software licensed under GNU GPL which can handle related CD/DVD tasks such as copy CD/DVD, burn CD/DVD, burn music file into audio file in CD so that in can be played on most media player. KDE >= 3.2 - KDE is the great window manager, the powerful desktop, the very powerful c++ library K3b is based on, and a lot of programs. QT >= 3.2 KDE 3.2 requires the QT library version 3.2, a cross-platform GUI development toolkit. Since K3b is a threaded application QT needs to be compiled with threading support enabled. cdrecord/mkisofs - Cdrecord creates home-burned CDs with a CD-R/CD-RW recorder. dvd+rw-tools - The DVD+RW-Tools are used to burn and format DVD+R(W) and DVD-R(W) media. To enable all K3b DVD burning features version >= 7.0 is required. Type k3b, double click on serach result and click Install. Wait until installation completed! Now you can open K3B after install by clicking Start Menu >> Administration >> K3B and main window of K3B will appear such as image above! If you are looking program such as Nero in Linux then K3B is the solution! K3B is friendly Linux software which become equivalent for Nero Burning Rom in Linux. Burn YouTube Videos on a CD/ DVD With DevedeNG in Linux, convert and burn youtube video to DVD. Want to create video CD or video DVD so you can watch them on your TV with DVD? DevedeNG is the solution! Software to make a video CD for Linux so it can be played on any video player. If you have any video downloaded from internet such as YouTube video, Vimeo video, Twitter video and etc and you want to play it at your DVD player so you have to burn your video into a CD or DVD. DevedeNG is a linux software which is used to burn youtube video to disc (CD/ DVD), suitables for home players, from any number of video files, in any of the formats supported by Mplayer. The big advantage over other utilites is that it only needs Mplayer, Mencoder, FFMpeg, DVDAuthor, VCDImager and MKisofs (well, and Python3, PyGTK and PyGlade), so its dependencies are quite small. After file downloader, install it by double clicking the file and click "Install Package"
Devede NG is the best linux software to burn any video or youtube video to video CD/ DVD. With this application you can create a video DVD suitable for all DVD home players, create a video CD with picture quality equivalent to VHS, create files compliant with DivX home mpayers in Linux.